Wire is a secure messaging service that offers encrypted text, audio messages and voice and it has just become open-source. Wire’s source code has been posted on GitHub and it includes various bits and pieces from its native Android, iOS, Mac OS X, and Windows apps – plus its web app, which is compatible with Linux. Wire is well known for its promises with regards to robust data privacy and the messaging service is inviting security testers, developers, and wannabe-tinkers to review the code and help contribute by building their own Wire clients. Open-sourcing the full Wire client code base represents an important milestone [for the company and the challenges it faces]. We can also imagine in the weeks, months and years to come that an open source, secure messenger client could be appealing in an internet of things paradigm, digital health and the automotive industry too. If you are a developer or an interested hacker you can find everything you need to get started on the Wire GitHub account. have you used Wire before? Perhaps you should give it a try and let us know about your experience with it. I have tried to use it, but I failed because the interface is so… let’s call it “unorthodox.” Maybe I’ll give it another shot, but I’m pretty happy with Threema. 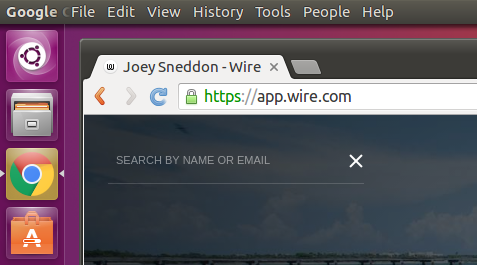 Last time I checked, there wasn’t a single one of my contacts using Wire.